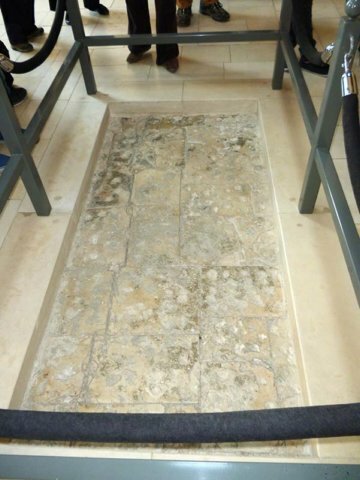 The spot in the Barracks where Mirza Mihdi (son of Bahá’u’lláh and younger brother of Abdu’l Bahá) fell from the roof of the prison and was fatally injured. Due to the hot temperatures at the time, it was Mirza Mihdi’s custom to say his prayers on the roof of the prison and walk back and forth. One day he was so rapt in prayer, he didn’t watch where he was going and fell through a skylight in the ceiling to the spot pictured in this photo. Bahá’u’lláh came to him and asked him what was his wish. Mirza Mihdi in his last words wanted his life to be a sacrifice so that the Bahá’ίs could come to the prison and be in Bahá’u’lláh’s presence. Because of Mirza Mihdi’s sacrifice, I and millions of other Bahá’ίs have been able to come on pilgrimage.